The moment you spot Mimsy in her distinctive mobile tattoo parlour, you know she is not your ordinary tattooist. 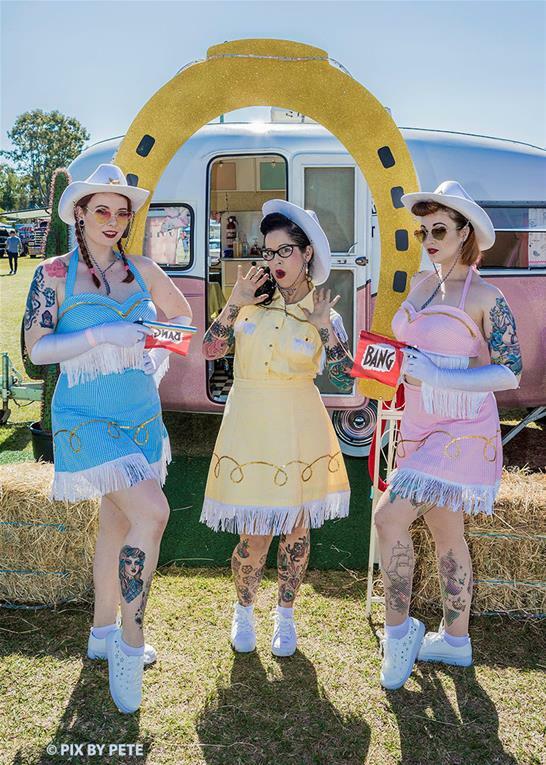 Mimsy's Trailer Trash Tattoo is an iconic landmark at GreazeFest, with it's pastel pink 1959 Sunliner caravan, complete with white picket fence and pink flamingos in the garden. Mimsy will hitch her caravan at GreazeFest at Redland Showgrounds. If you want a tattoo, the design is preferably palm sized and with a kustom kulture theme, e.g. pinup, hotrod, 1950s, music etc. Email your idea/s to Mimsy and book in your appointment. Include information such as your idea, the size and the placement. And if you are un-inked, you can still pick up a Mimsy print and heaps of kool merch!